Latvian studio Didzis Jaunzems Arhitektūra recently completed construction of the Nature Concert Hall, a striking angular pavilion for outdoor cultural events. Located within the grounds of Gauja National Park, the shelter can accommodate different activities under its unique lightweight roof. Built from a steel structure that rests gently on the ground, it’s wrapped in vertical fabric louvers that play with the wind and light. The Nature Concert Hall is surrounded by a luscious biotope meadow at Gauja National Park in Latvia. It is designed to shelter multimedia and nature-related educational events on science, dramaturgy, music and art. Resting on four points on a platform, it canopy design causes minimal impact on the ground. The steel structure’s heightened parts can be used as screens for video or projections. 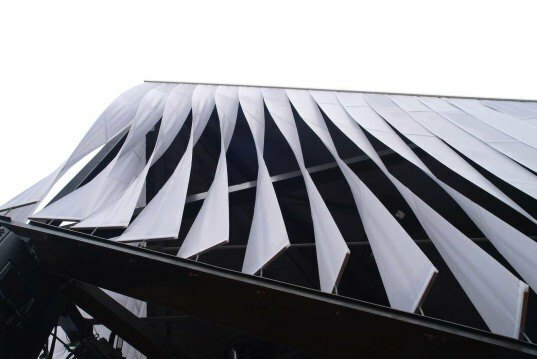 Its white facades are made up of vertical fabric strips called louvres that can be rotated. This creates different visual effects while they move with the wind and filter the light. Its modular design allows the pavilion to shelter both big and small events; it can even fit a whole symphonic chamber orchestra of 20 people and their instruments. The Nature Concert Hall is surrounded by a luscious biotope meadow. It is designed to shelter multimedia and nature-related educational events. It causes minimal impact on the ground. The steel structure's heightened parts can be used as screens. Its white facades are made up of vertical fabric strips. The fabric strips on the facade create different visual effects. Its modular design allows the pavilion to shelter both big and small events.